NGO (http://hope-ngo.com/Education/NorthernPakistanHomeSchools.aspx), continued its philanthropic activities by arranging a series of Iftars for the underprivileged. One of these Iftars was arranged in Bhittaiabad, Karachi. Approximately five hundred Children attended this Iftar followed by dinner. These children were from Sachal Goth, Bhittaiabad and Abdullah Shah Ghazi Informal Schools. This Iftar was sponsored by Asim Siddiqui and family along with Haniya Mehmood , Hoori Mehmood and family from HOPE Dubai. 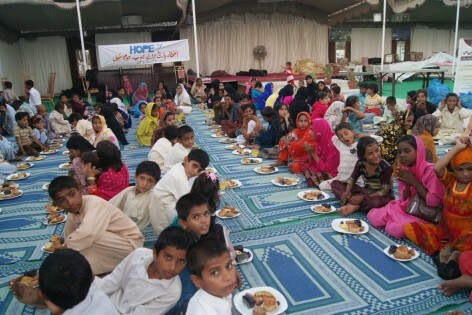 It is pertinent to mention here that the entire Iftar and dinner arrangement was held under the supervision of Dr. Mubina Agboatwalla child specialist Karachi and Chairperson HOPE (http://hope-ngo.com/Home.aspx). Other than the Iftar and dinner arrangement, Eid Gifts were distributed by the Chairperson to the participants of Iftar. HOPE NGO is thankful to such sponsors who remember the needy and share with them with whatever they could possibly give. It is a source of sheer happiness to see the kids smile when they get something they cherish.